Do you know what I am doing now? I’m curled up under my comforter, snuggled up to my favorite pillow and teddy bear and typing this side ways with one hand. I’m too comfy to get up!! I don’t want to go to work today! “I have the measles and the mumps; a gash, a rash and purple bumps; my mouth is wet, my throat is dry. I’m going blind in my right eye. My tonsils are as big as rocks, I’ve counted sixteen chicken pox” Anyone know where that’s from?? Do you know what I did Sunday? I went grocery shopping and bought things to make this week. More specifically, I bought ingredients to make 3 different breakfasts and one meal. hmm… last time I checked, there was really only time for one breakfast in the day, not three! What am I going to do with stuff to make 3 breakfasts all week?? Preheat oven to 350 degrees F. Place blueberries on a nonstick baking sheet with a pinch of salt. 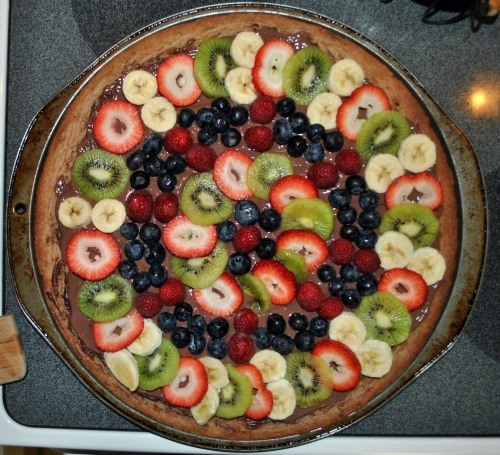 Place in the oven and roast for 20 minutes, or until berries start to burst. (At this time, if you don’t have granola or didn’t make it prior to, mix up the coconut granola recipe below and bake it at the same time, on the upper rack.) Remove both and set side. While blueberries and granola are baking, add quinoa and coconut milk to a saucepan along with another pinch of salt and the coconut flakes. Bring mixture to a boil, then reduce to a simmer and cover, cooking for 15 minutes. Fluff with a fork. 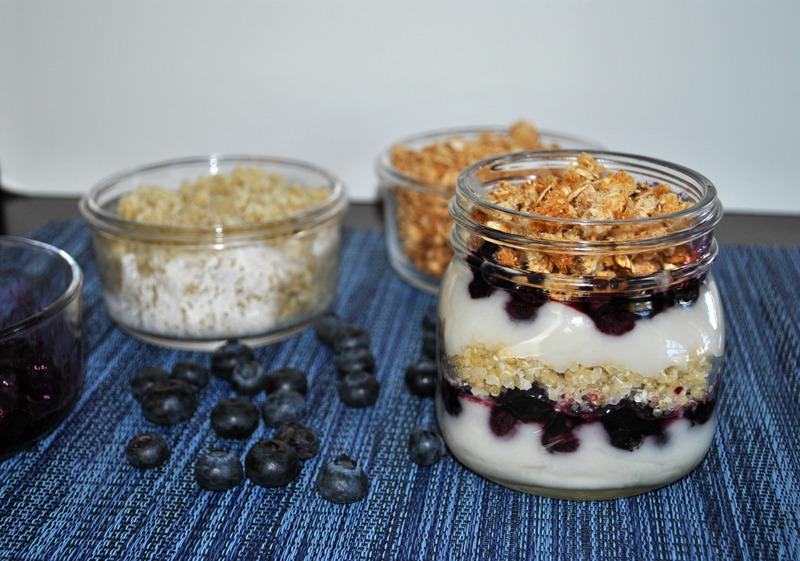 When ready, assemble parfaits with layers of yogurt, roasted blueberries, coconut quinoa and granola. YUM! 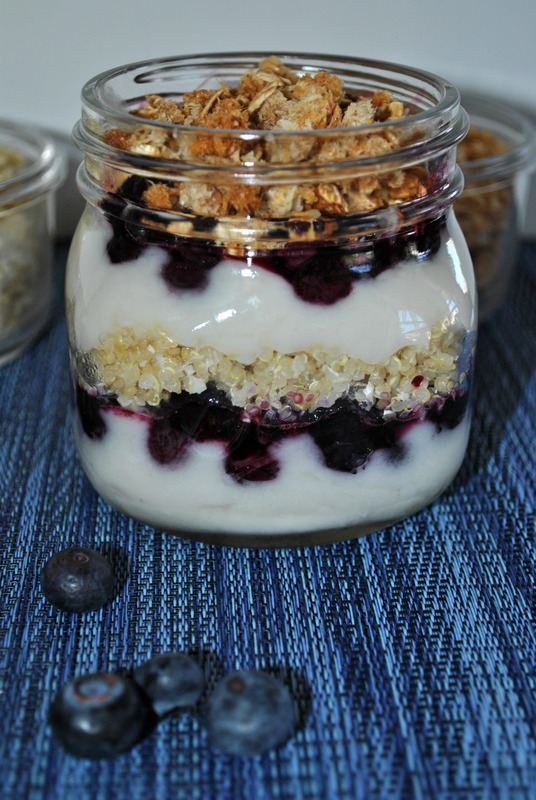 Or, if you are bringing this to work or on the go, assemble the parfait but leave out the granola. Leave enough room at the top so you can add the layer of granola when you are about to eat it, that way it doesn’t get soggy. In a large bowl, combine oats, coconut, cinnamon and salt. Melt coconut oil and add it to the oats, along with maple syrup and vanilla, and stir thoroughly to moisten. Spread on a baking sheet and bake for 20-25 minutes, tossing every 5 minutes. Remove and let sit for about 10 minutes to get crumbly. How Sweet Eats is one of my favorite blogs, hands down. It definitely isn’t vegan, though. So when she makes something that I can easily adapt, I get super excited! This breakfast was delicious! One more day until we get a mid-week day off! I have to say, even though I’d rather be on vacation this week with everyone I know, the lack of traffic in Boston is beautiful! It took me 7 minutes to get to work. 7! It usually take me at least 20. I am way too excited about this. So what are everyones plans for the 4th? I foresee some serious sleeping in and laziness occurring for me. Maybe a mid-day BBQ, definitely a margarita and overall just enjoying the day I have off while secretly praying my 6-930 shift at my retail job is cancelled. One things for sure- I will be concluding my BBQ lunch with these Popsicles, which I am a HUGE fan of. I’ve been craving popsicles like crazy lately but I haven’t been able to find popsicle molds anywhere. 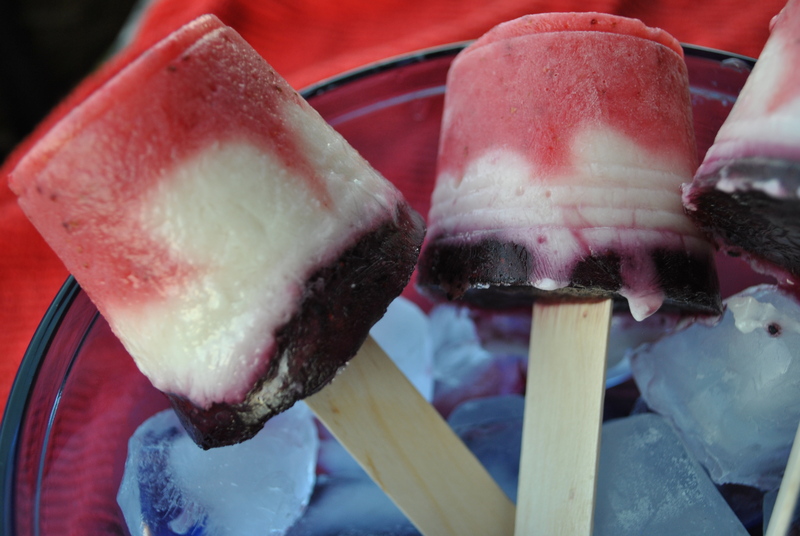 Popsicles are like the new cupcake. Come on, stores! Instead, I went the old fashion route- dixie cups, popsicle sticks and a spring form pan to keep the cups from rolling around in my freezer. Success! I imagine a lot more popsicle recipes in the future. Chocolate mint? 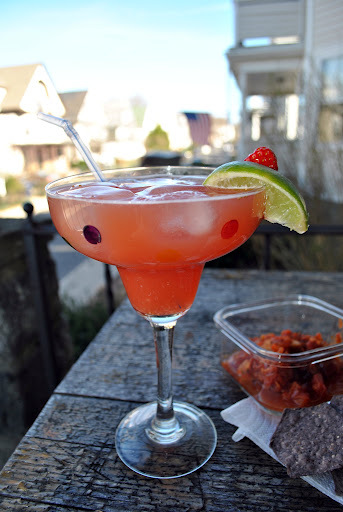 Strawberry margarita? Cookie dough? oh yeah! 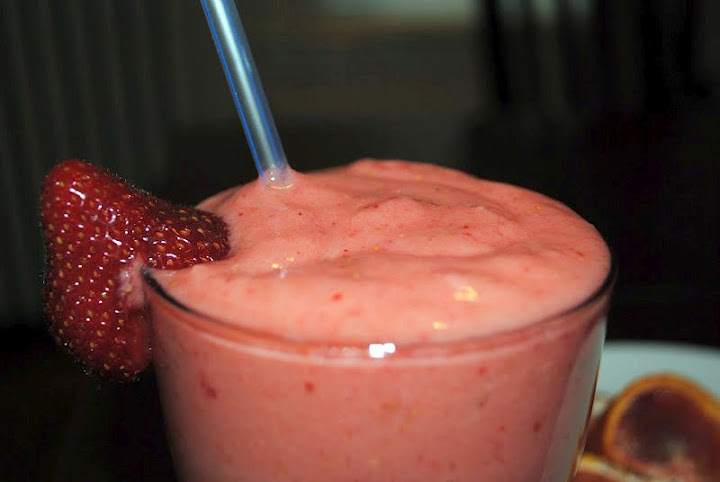 Place the fresh strawberries and 2 TBSP yogurt in a blender and process until fully combined. Transfer to bowl and set aside. 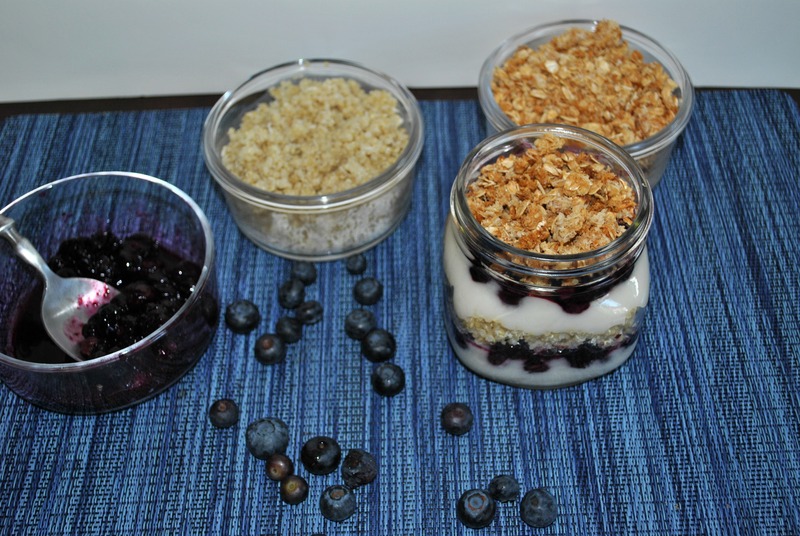 In the blender, process the blueberries and 2 TBSP yogurt until full combined. Set aside. Layer approximately 1 1/2 TBSP of strawberry mixture, 3 TBSP yogurt and 1/2 TBSP blueberry mixture in each mold or cup. 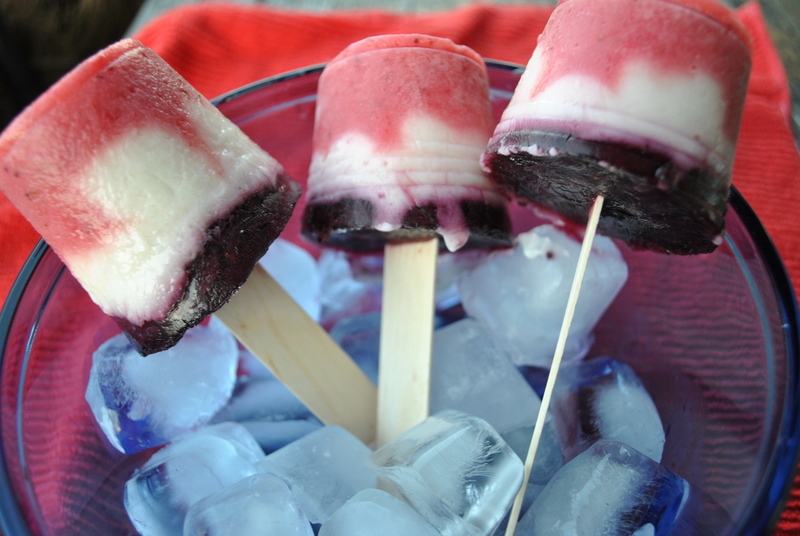 Top with holders or cover plastic cups with tinfoil then insert popsicle stick. If you are using plastic cups, place the cups in a deep pan to hold them together in the freezer. I used a round springform plan and it worked perfectly! *The original recipe said this made 12 popsicles by doing a 1:2:1 ratio of fruit, yogurt, fruit but when I tried doubling it to 2:4:2, I barely got 5. This 1.5:3:1.5 ratio I provided above should comfortably give you 6 popsicles. And know for some great vegan recipes that should please everyone at your BBQ, or at least give you something to munch on! 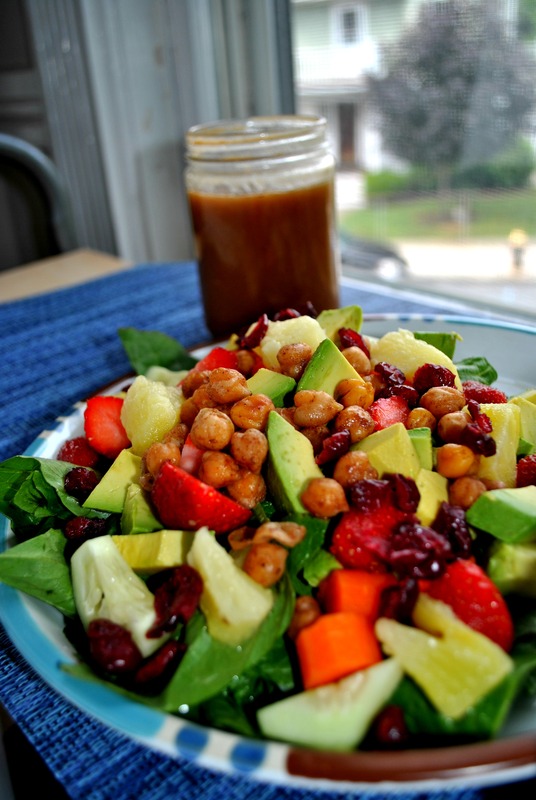 Strawberry Chickpea Salad with Cinnamon Dijon Dressing- A change from the heavy pasta and potato salad, this dish would work as a side or as a full meal for those not interested in grilled meat. Perfect Chocolate Cupcakes– Though these are chocolate and not white, which would be more ideal for the holiday, they are the perfect not-too-sweet cupcake that has always gotten thumbs up when served. You can go crazy with the frosting and sprinkles to make them more festive! This round up has made me realize two things: 1. I have A LOT of dessert recipes and 2. I have A LOT of strawberry recipes. Good things 4th of July cook outs are perfect for both! Have a safe 4th of July everyone! or b. having a romantic evening by yourself that may or may not involve a large box of dark (hopefully vegan!) chocolates, your over sized pajamas, and The Notebook. Either way though, whether your shoveling chocolate into your mouth alone or pasta into your mouth in the company of another, you should quite possibly go easy with the calories this weekend. It will make you fell less guilty when you have to slip into your lingerie/ move on from the chocolates to the icecream, depending on your situation. 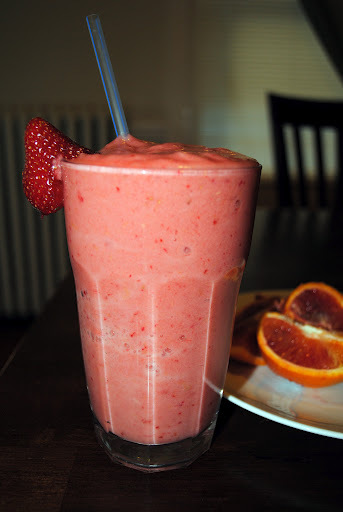 This smoothie would be perfect for breakfast or a meal replacement. 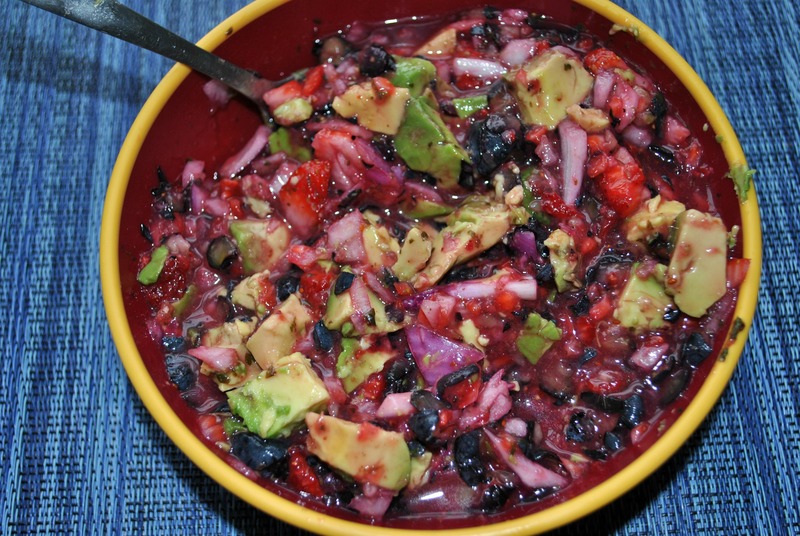 It’s packed with fruit and contains yogurt and flax seed to help fill you up. As a bonus, it’s a fun pink color, naturally, so you don’t have to resort to food coloring. 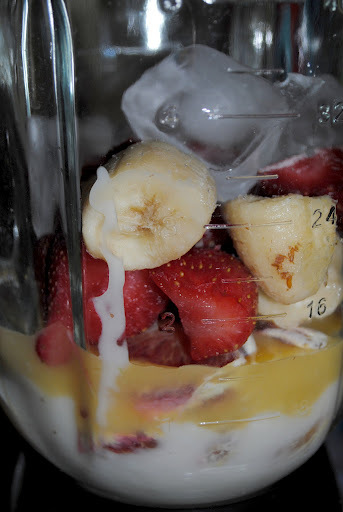 Combine all the ingredients in a blender and process until completely combined. * I only added 1/2 the banana because with all the Green Monstahs I’ve had, I was kind of banana-ed out. But feel free to add a whole if you like the taste. It will thicken the smoothie up a bit. This smoothie is a temporary replacement for the Green Monstah smoothie I’ve been consuming almost non-stop lately. I’m actually getting really sick of it. Thursday morning I could only drink about half before I just couldn’t stand the idea of taking one more sip. Clearly, it was time for a change! It doesn’t have quite the same nutritional punch as the Green Monstah but it’s refreshing enough to start your day off with! Here’s hoping you spend your Valentine’s with someone other than your Teddy Bear and Noah Ryan Gosling.